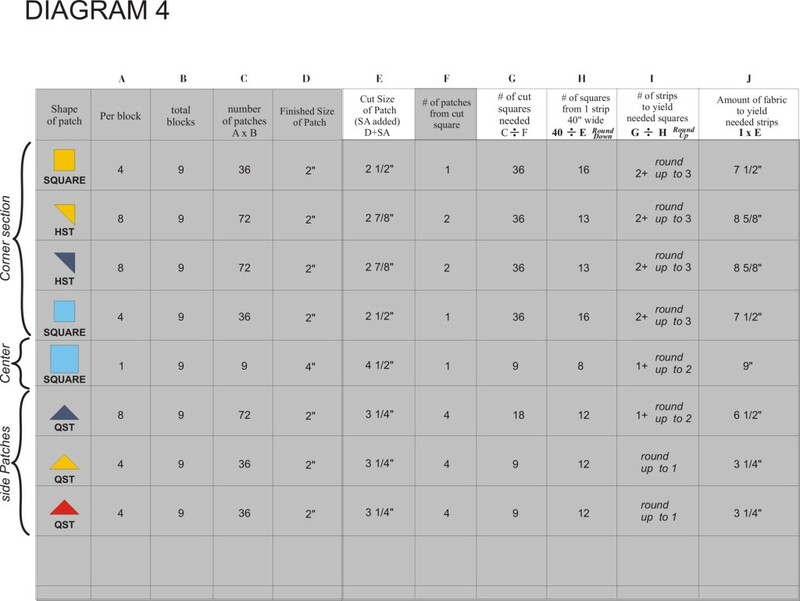 In the previous segment, we charted the patches and figured out WHAT we needed, in order to make the blocks for the quilt. In this, Part B, we will do all the heavy math and calculate how much fabric is needed to cut all those patches. When you buy fabric off the bolt, the typical width of the fabric is 40” so we will be working with a width of fabric of 40”. the length of fabric is how many yards you are buying from off that bolt. This is what we will be figuring out. If we were to cut a strip of fabric, and then cut the size squares needed from the strip, we would need to figure out how many squares we could get from the strip. In column H: We will divide 40, the width of the fabric, by the number in column E : the size of the cut square, to determine the number of squares we will get from a single strip. 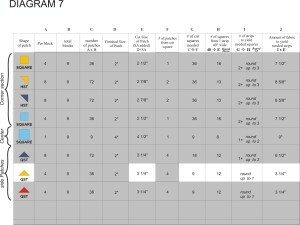 In column I: to determine the total number of strips needed to yield the necessary squares, we will divide the number in column G the number of cut squares needed, by the number in column H, the number of squares you can get from a single strip. 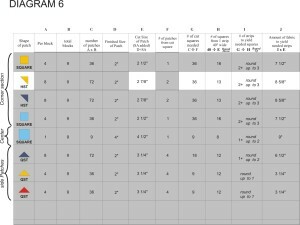 In column J: we will multiply the number in column I, the total strips needed, by the number in column E, the size of the cut square which is also the width of the strip. This will give us the amount of fabric needed for these patches. Lets apply this to the square patch. For the square patch: 40 , the width of the fabric, divided by 2 ½” the width of the cut square = 16. so you can get (16) 2 ½” squares from one 2 ½” wide strip. We need 36 squares, so 36 divided by 16, the number of squares we can get from a strip = 2 with a remainder. Here we will need to round up to 3, because 2 strips will not be enough for all the squares needed. 3 strips, each 2 ½” wide, is a total of 7 ½” of fabric that is needed for the square patches for all the blocks in the quilt top of this fabric. 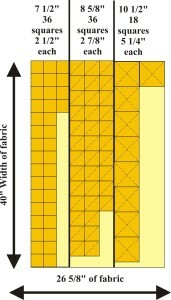 For the half square triangle: 40”, the width of the fabric, divided by 2 7/8”, the width of the cut square = 13 with a remainder. In this case, we will round down to the whole number, because the remainder will not give you a full square needed for the patches. We need 36 squares cut, so 36 divided by 13, the number of squares from a strip = 2 with a remainder. Here we will need to round up to 3, because 2 strips will not be enough for all the squares needed. And 3 strips, 2 7/8” wide = 8 5/8” of fabric that is needed for the half square triangle patches for all the blocks in the quilt top in this fabric. For the quarter square triangles: 40, the width of the fabric, divided by 3 ¼”, the width of the cut square = 12 with a remainder. Again, here we can round down. We need 9 squares, so 9 divided by 12 , the number of squares we can get from a strip = less than 1 so we will round up to 1. 1 strips 3 ¼” wide = 3 1/4” of fabric that is needed for the quarter square triangle patches for all the blocks in the quilt top in this fabric. 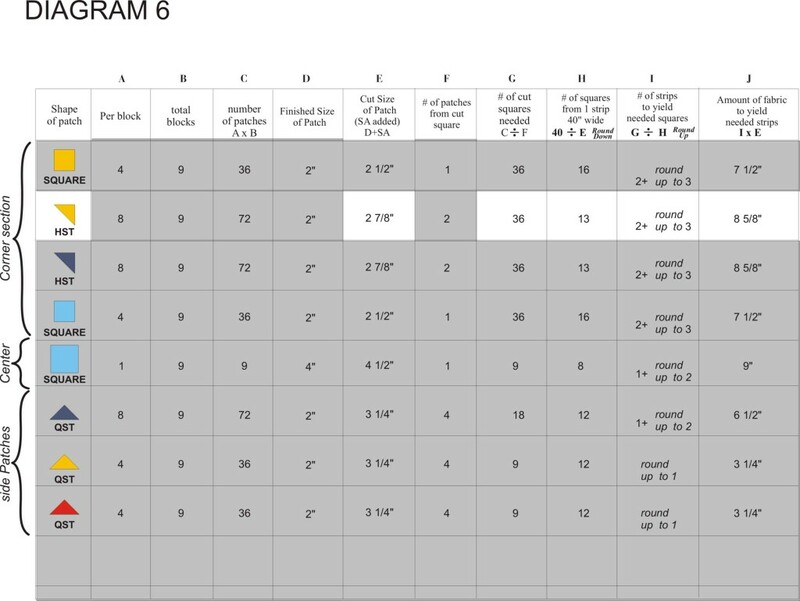 In this final diagram, we have added all the amounts from the different patches together, 7 1/2,” 8 5/8” and 3 ¼” to determine the total amount of fabric needed. 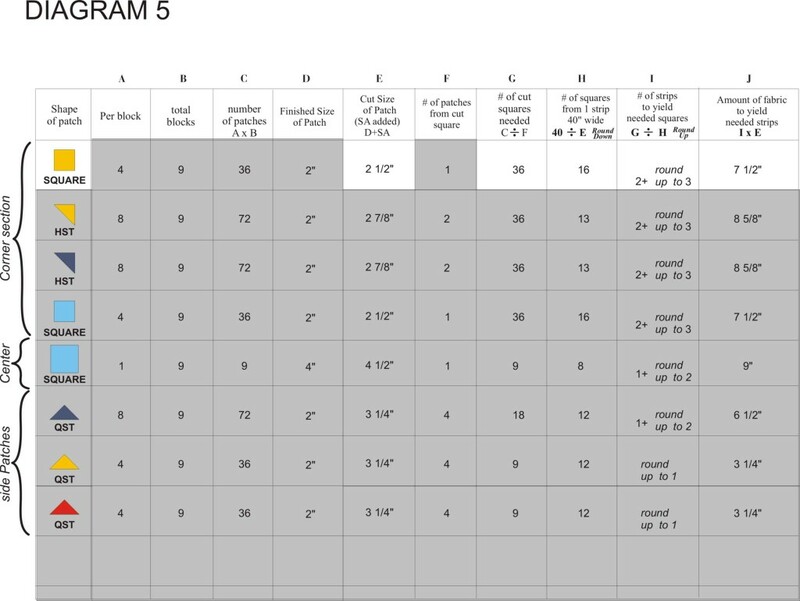 You can see the cutting plan for the yellow fabric is set up using the information we just calculated. the number of strips of each size and how each of those strips will be cut to yield the necessary patches in the fabric for the quilt. 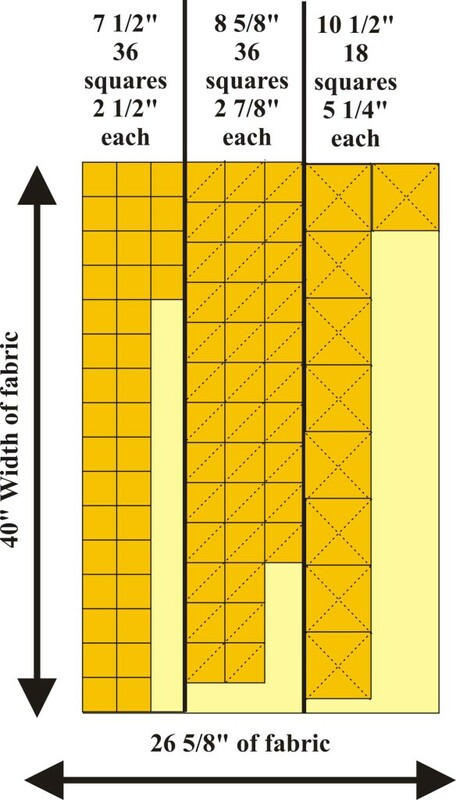 The lighter yellow area shows the extra fabric after everything necessary has been cut. Here’s a little tip on buying fabric, cutting mistakes happen. when I buy fabric, I like to make sure I have enough for 1 extra strip of each size that i plan to cut. So in my case, I would add an extra ¼ yard. Enough for and extra 2 ½” strip, 2 7/8” strip and 3 ¼” strip. 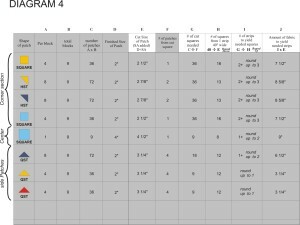 Now you can see how simple it is to calculate fabric amounts yourself when enlarging or reducing blocks or simply adjusting patterns to suit your desire.